I'm going to give the whole "photo a day" thing a try again. I tried doing this a couple of years ago, and failed miserably. I think I made it to March or April, but even in that time period I had gaps. But with my new photography habit, I'm more than willing to try it again, and hopefully can get some of my photography friends to do it as well so I have a motivation partner. In any case, I also figured the photos don't have to be awesomely perfect, but I can't just take a random photo of say, my scanner (although I will have to add in technology photos this year, so maybe that wouldn't be a bad idea). On New Year's Day, my friend Marie was in from Canada (or as we like to tease her: "Ca-nay-dee-ya"), and came over for dinner along with Randy. Leif made Spaghetti A La Bacon (he's still a better cook than I am), salad, and for dessert we had Cream Puffs from the store. 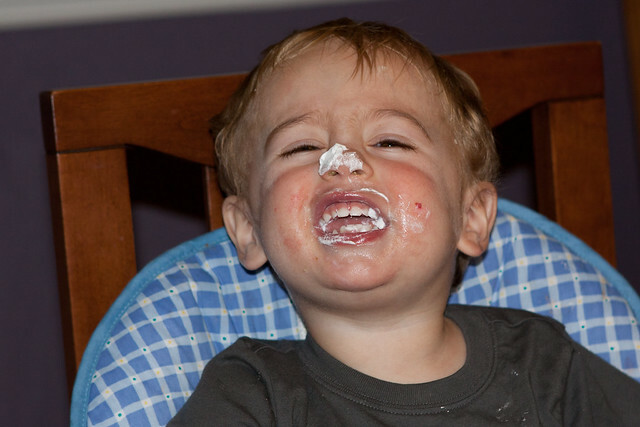 Peter decided he really liked the whipped cream. This is of his own doing, and his infamous "cheese" face whenever someone takes his photo now. 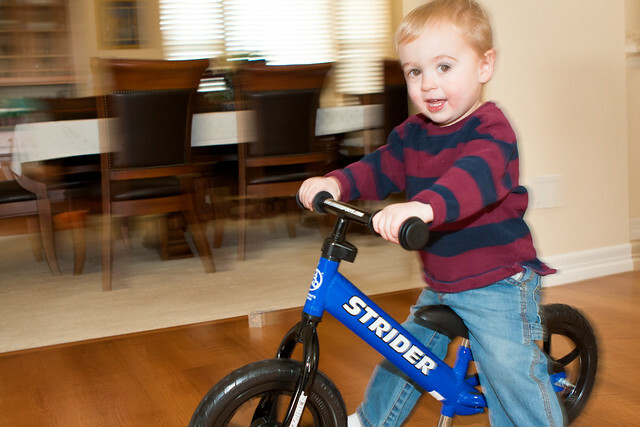 A few months ago, Leif told me he wanted to get Peter a Balance Bike. My initial reaction was "hell no, he's too young," but I promised to read up on it. The Strider got amazing reviews, so I relented. We didn't want to bring it up to the cabin, so we waited until the weekend to open it. Who would've known he'd take right to it, and although he still needs work, he was speeding down the hallway in no time.